If you wish to analyze the usage data of the application using Google Analytics, you can check the Windows SDK for Google Analytics GitHub repository and build the project located in GoogleAnalytics.Core. You then need to add a reference to the generated assembly (GoogleAnalytics.Core.dll) to your custom project. The GoogleAnalytics.Core.dll assembly has a dependency against .NET Framework 4.5.1 which should be targeted in the client`s application. This article demonstrates a simple implementation according to the API provided by the Windows SDK for Google Analytics. Me.m_userAgent = "Mozilla/5.0 (Windows NT 6.3; WOW64; Trident/7.0; rv:11.0) like Gecko"
You can then use this provider in your custom implementation of the ITraceMonitor interface. Please note that you have to pass your own Google Analytics tracking ID in the CreateTracker method of the TrackerManager. // Measuring timings provides a native way to measure a period of time in Google Analytics. // This can be useful to measure resource load times, for example.
' Measuring timings provides a native way to measure a period of time in Google Analytics.
' This can be useful to measure resource load times, for example. All that is left is to set the static ControlTraceMonitor.AnalyticsMonitor property, possibly in the constructor of your application. 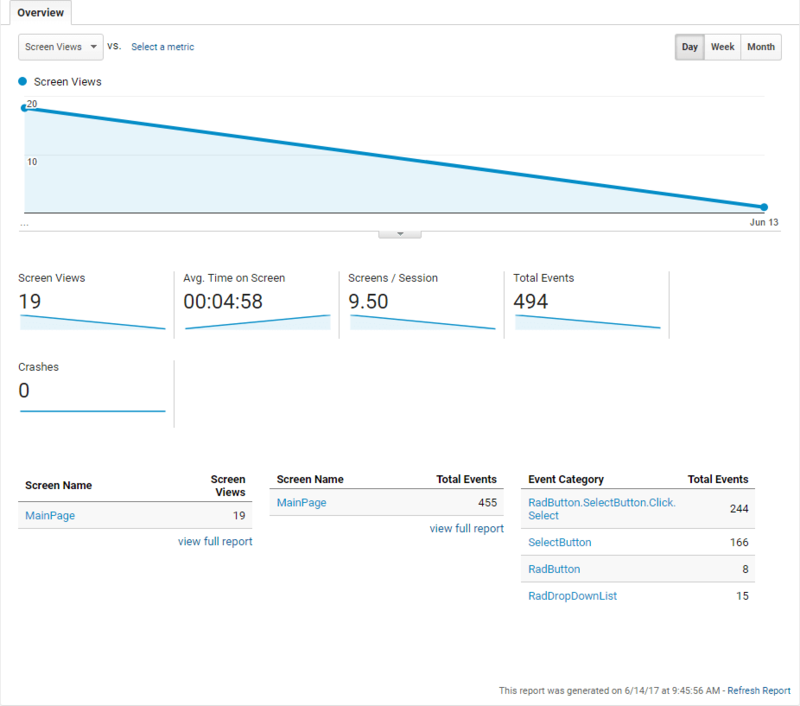 If you then go to the Google Analytics dashboard after some user interaction has took place, you will find information and statistics for the registered features similar to the ones shown below.